When I was pregnant with my son, I frequently craved mexican food and made this recipe a lot. I found the original version on allrecipes.com but I don’t think the poster still has a profile so I can’t give her credit. So, I’m putting it out there: if you are this lovely person who got me through some very strong pregnancy cravings, please do contact me so I can give you some cred. Moving on. I usually call this Mexican lasagna, but since it’s really more like a casserole, let’s call it a Mexi-casserole. It’s super easy, quick, and delicious even the next day. Serve with guacamole, tortilla chips, and obviously, margaritas. You can thank me later. Feeds one hungry pregnant girl, or about 6-8 normal people. Don’t judge. Preheat oven to 350 degrees. In a large pan over medium-high heat, cook ground beef until no longer pink. Stir in salsa, reduce heat, and simmer 20 minutes, or until liquid is absorbed. Stir in beans, and heat through. Spray a 9×13 baking dish with cooking spray. Spread crushed tortilla chips in dish, and then spoon beef mixture over chips. 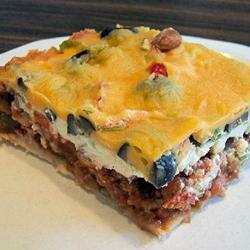 Spread sour cream over beef, and sprinkle olives, green onion, and tomato over the sour cream. Top with Cheddar cheese. Bake in preheated oven for 30 minutes, or until hot and bubbly. Slice and enjoy!